For me, birds and art have always gone hand in hand. My interest in birds began as a little girl watching my brother draw a cardinal from the cover of an old Peterson field guide. (Interesting fact: I was born in the same hometown as Roger Tory Peterson, father of modern birding.) In elementary school I would draw birds on poster boards, write reports to accompany them, and even create meticulous mobiles of the undersides of hawks to hang above my bed. As soon as I began loving birds, I began to draw them. Over the years, birds have taken me on many happy and aesthetically beautiful adventures, from hunting for Red-faced Warblers in montane ponderosa forests to chasing a Fork-tailed Flycatcher in Indiana Amish country. Along the way I gained a desire to help others see the beauty I saw in birds. 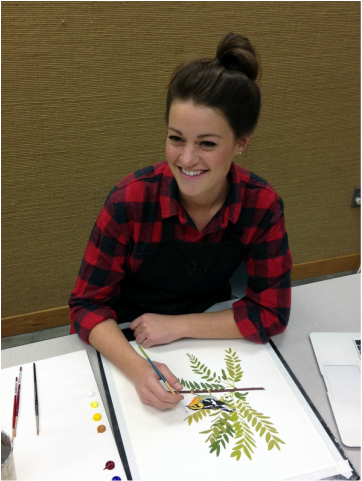 I graduated from Brigham Young University-Idaho with a BA in integrated studio art and since then have pursued a path in natural history art inspired by antique natural history illustrations. I hope my artwork will introduce many others to the significance and beauty of birds so that birds can benefit the lives of people, and in turn, people can benefit the lives of birds.